As their caretakers, breeders and owners have a responsibility to ensure that every horse, whether a winning champion or an aging pasture pet, is treated humanely and with compassion. In a perfect world, when horses change hands, they go from one loving owner to the next, and are bred only when the breeder can guarantee a good home for each foal. Responsible owners research the costs of feeding and caring for a horse – they know what they are getting into before making the commitment of ownership. They evaluate the temperament, talents and abilities of a prospective new mount to ensure that these attributes match the qualities required to suit the horse’s intended use. When they encounter behavior issues or training problems, they don’t blame the horse, but instead seek to overcome them. They prepare for unexpected emergencies, provide lifelong care, and, when circumstances warrant, work to ensure that any horse they can no longer keep goes only to another responsible, caring home. Responsible breeders share common characteristics. They carefully breed their horses to minimize lameness or other conformation flaws. Horses are started slowly and trained correctly. The responsible breeder, the kind of person whose reputation for producing sound, quality horses is known to his or her peers, demonstrates a commitment to improving the breed over any desire to make money or gain fame, and discloses any genetic health related issues in the breed or the animal’s bloodlines. Complete veterinary records are available for every animal. For their part, breeders want to know that the horses they’ve raised are in good hands. For this reason, hundreds of breeders nationwide have pledged to take back or help rehome any of the horses they have produced, at any time, for any reason, if their current owners are unable to care for them. Responsible breeders do not dump excess horses from breeding operations, (such as unwanted young stock and broodmares whose serviceable days have ended) at kill buyer auctions or dealers. Regrettably, some in the US horse industry do seem to view the number of horses bred and born as an indicator of industry success. 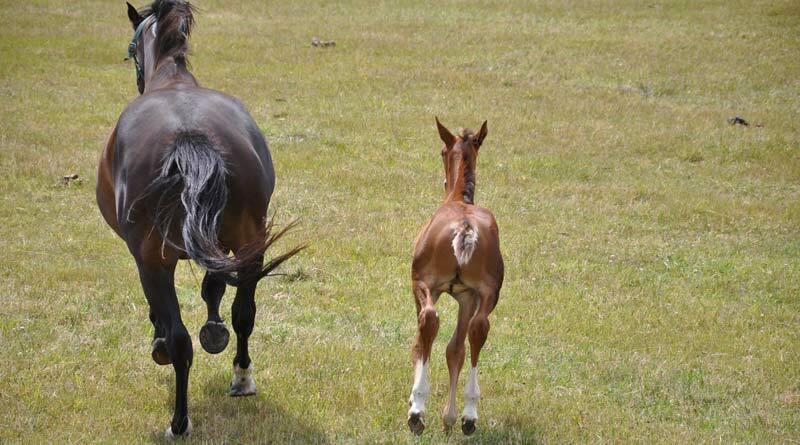 Registries boast about increases in stallion breeding and foal registrations with little evident concern over whether that there is an actual market for those animals. That’s not right, as the horse industry must take responsibility for ensuring that the number of horses bred is in sync with market demand, and that every horse has a reasonable expectation of having a lifetime home and appropriate care. One way of achieving this balance is to focus on increased quality and reduced quantity – increasing the desirability and prices for those horses bred. In Europe, horse registries help to regulate the number of horses to be bred. US registries can help by increasing their registration fees (to discourage backyard breeders and indiscriminate breeding by large-scale breeding farms), and educating breeders about market conditions driving demand. If breeders and owners can all agree to minor voluntary changes, then the quality, training and value of horses in the marketplace can be increased and the possibility of the slaughter of sound, healthy horses eliminated. These minor changes include postponing raising a foal for one or two years, reducing large-scale breeding operations by a modest amount, and reconsidering horses who display minor issues that can be resolved with effective training. Breed and discipline-specific groups should encourage and support outlets for redirecting equine athletes into second careers. After they have given us so much in competition, they deserve the chance to thrive in a new life – not to be cast aside to languish in a field, or shipped out to auction and an unknown fate. Industry sectors that were once notorious for sending spent horses to slaughter – such as the Thoroughbred racing industry – have begun to develop and support rehabilitation and rehoming programs. And so can the rest of the industry. We must also increase awareness of the need to support horse rescues and sanctuaries. Horse rescues provide a needed short-term solution for the rehabilitation and re-homing of horses who become at-risk due to owner ignorance, neglect, or financial hardship. However, rescues cannot be viewed or used on an ongoing basis as a means to dispose of horses created by wanton overbreeding or discarded by irresponsible owners. Animal protection groups, governmental agencies, horse industry organizations and professionals must work together to educate new horse owners about the care needs, costs and responsibilities of ownership, including preparedness for end-of-life decisions. Educational initiatives should encourage only responsible breeding, training of horses with behavioral issues, and recommend humane euthanasia only when the horse’s health, well-being or quality of life has been compromised. The problems of economic downturns, conversion of hay and feed croplands to other uses, droughts and the resulting high price and low availability of hay and feed are all, to a large extent, unavoidable and beyond the control of the industry. But most horses born in the US are the result of a person’s conscious decision to breed their horse. We can and should seek to achieve an equilibrium between supply and demand, to forge a solution that will benefit horses, owners, and breeders alike. In his role as Senior Adviser, Equine Protection for The Humane Society of the United States, Keith Dane directs the domestic horse welfare policy work for the nation’s largest animal protection organization. Those efforts include nationwide campaigns to end horse slaughter and improve the welfare of horses used in sport, work and racing. Dane previously served as executive director of Friends of Sound Horses, an organization established to eliminate cruelties in the Tennessee Walking Horse industry, and was FOSH’s liaison to USDA for Horse Protection Act enforcement. Keith Dane is the Senior Adviser, Equine Protection for The Humane Society of the United States. Awesome article listing sound strategies that will help to eliminate slaughter. Sharing!